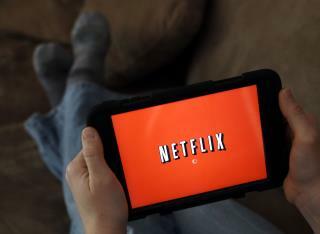 (Newser) – Netflix wants you to watch more Netflix. To that end, the company has been testing how the cover art that accompanies a movie or TV show influences a viewer's decision to ultimately watch it, the Daily Dot reports. Netflix figures it has about 90 seconds to capture your attention before you lose interest in watching a movie, writes the company's Nick Nelson in a blog post, and the best way of doing that is through images (which, a previous study found, is where watchers put 82% of their focus). "Imagine having to tell your friend about the last movie you watched through a single drawing on the back of a playing card," writes Nelson. Close-ups of expressive faces that "convey a wealth of information … regarding the tone or feel of the content" outperform images depicting "stoic or benign expressions." The effectiveness of an image decreases when it contains more than three people. Writes Nelson: "While ensemble casts are fantastic for a huge billboard on the side of a highway, they are too complex at small sizes." Cover art that depicts villains performs "surprisingly well in both kids and action genres in particular." Due to what Netflix calls "regional nuances," the performance of artwork varies by country; for example, the top Sense 8 image was different in the UK, US, Brazil, and Germany. From the Verge: "There's definitely some sneaky demographic targeting going on" that is driven "at least partially by racial identity." Yeah! But who at NETFLIX watches the watchers watching you? Hmmmm.... There ya go ALL!! The gig is up, the fix is in. I "borrow" the account of a family member. One day they called me and asked if I had created an icon for Anabel, the 5 year old. I said, "No, I wouldn't tamper with your account." Then they asked Anabel if she had created her own page. She said, "Yes, I wanted to have my own favorites."